When undertaking a new website design for a healthcare organization such as a hospital, or medical clinic, a true understanding of how users expect to view the website is critical. Since 2003 Parachute Design has been creating successful website design for healthcare organizations in Toronto and around the world. Building on this experience our team of web designers and web developers have crafted a solid understanding of the best web design style to help healthcare organizations communicate with their audience effectively. Web design for healthcare organizations must offer a clear and professional format that is responsive and accessible for all. Information found on healthcare websites may at times be sensitive, so security is often paramount as well. 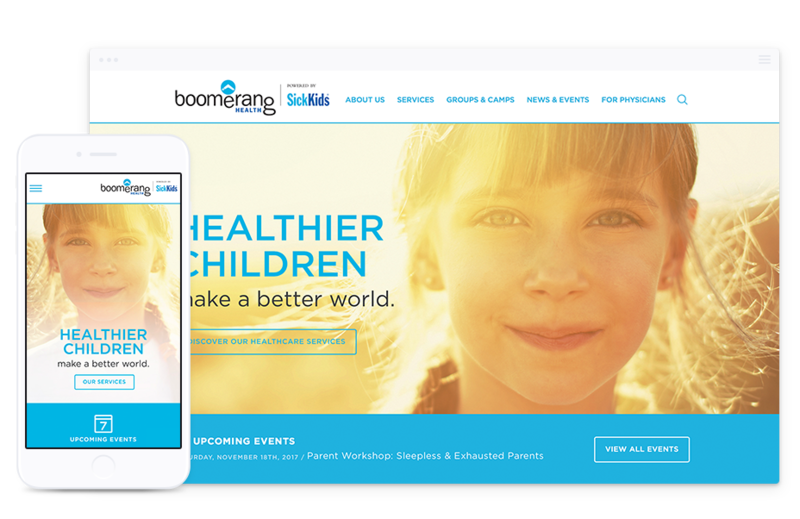 For a visual explanation and better understanding of our we apply these techniques to create the best web design for healthcare organizations, please have a look at our Boomerang Health case study. To further understand what makes a healthcare website design successful, let’s review some of the best practices we’ve established over our years in the Toronto web design industry. Information is critical within a healthcare website. As a web designer, our priority is to understand how web users will expect to engage with the content shared on the website. In most cases, the information will take precedence over all else. Creating a website interface that is clean and presents information in a clear and well-organised format ensure that users will not be distracted by unnecessary elements or features within the website design that can steer them off track and lead to user frustration. Also contributing to a clear and well-organised website user interface design is a well-executed navigation system. During our website strategy phase, we review current web analytics and user behaviour to understand how users are currently using the website and where they may be having trouble finding information. As we identify these elements early on in our web design process, we can create reliable and intuitive website navigation through wireframing and design. Before approaching the creative website design phase, our team of web designers and web developers work together to establish a brand new website information architecture through a wireframing exercise. The wireframing stage is also the first point in a website design project that our clients dig in and get involved in the design process. Through the use of visual prototyping tools, we begin to restructure each unique page layout within the healthcare website and organise and distribute information in a way that will allow website users to find what they are looking for and understand it quickly. Website typography also serves a foundational role in the new website design. Understanding how we all read and scan a modern website for information allows our web designers to create typographic layouts and styles to aid users page by page search. Well-designed typography is very important in a website design for hospitals and other healthcare organizations because the page content is often quite long and cumbersome. Large amounts of page content can strain visitors eyes or make it difficult to find more specific information. A well planned typographic design can alleviate both these issues and provide users with a more positive user experience. If you pay close attention, most healthcare websites use a cool or muted colour palette. The decision to avoid bright or warm colours is most often the result of wanting to create a calm experience on the website. Cool, soft or subdued tones help users stay calm and help eliminate the sense of excitement, panic or urgency that warmer colour palettes often introduce into a user interface design. Muted colour palettes are also found in many hospital or healthcare web designs merely because they are less distracting from the vast amounts of information commonly found on the website. Choosing the right style of imagery is also an essential facet of our best practices for healthcare website design. A well-placed image can transform a web page design and also reinforce the message conveyed by the web content. Often, someone searching for information on a healthcare website is going through a very stressful and emotional time in their life. Introducing positive or calming photography within the hospital website design can help bring a small bit of comfort to visitors and create a favourable impression of the healthcare organisation brand. Healthcare organizations are typically “late adopters” of new website design trends and technology. However, creating a mobile responsive and accessible website design for healthcare organizations and hospitals is critical. Have you ever been waiting to see a doctor and pulled out your phone to look something up? Chances are you look around in the waiting room and just about every other person sitting there with you is doing the same. Should only ten percent of these people be accessing the clinic’s website, multiply that number by 24 hours a day and then 365 days per year. That’s a lot of mobile traffic! Healthcare organizations, clinics and hospitals have seen a boom in mobile web traffic simply because we all need medical care and we all have to sit and wait our turn. Ensuring that the healthcare website is responsive and accessible anytime, anywhere ensures that web users not only have constant access to valuable information, they might also be a little less frustrated when they finally do get to see the doctor! In our research, one of the most overlooked components of our best practices for healthcare web design is web compliance and accessibility. As the world works to become more inclusive and accessible to everyone, meeting standard website compliance has become a hot topic. In Ontario, organizations with more than ten employees are now required to meet a standard of website compliance and offer methods of reporting for users to share their experience on the website so that the hospital or clinic address any shortfalls. Creating a compliant website design for hospitals and clinics can yield more benefit that user experience and inclusivity; it can also help maximise search engine optimisation efforts as Google works to recognise website owners that make efforts to meet compliance standards. If you would like to inquire more about our best practices for hospital website design, please contact our healthcare web design experts in Toronto at 416-901-8633 or to request a web design proposal for your healthcare organisation, please complete our online quote request form. New a Web Design Quote for Your Healthcare Organization? Creating a successful website design can be a challenging task without the right experience. Let us help you put together a plan to create a winning website, the first time.